Set on a private, lush, and level 2 acres, this gorgeous French country Provincial style manor impresses with its stately brick exterior and interior aristocratic flair. The soaring ceiling and grand winding staircase of the fabulous cathedral entry welcome you into this elegant 2,819 sq.ft. 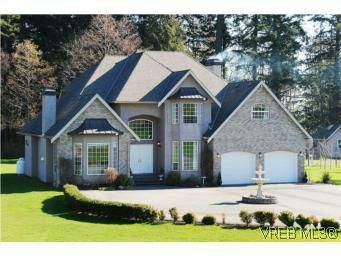 4 bedroom custom residence. The main level features gleaming hardwood floors, two fireplaces, gourmet kitchen and adjoining family room with French doors leading to the large south facing back yard. Offers a luxurious master retreat with lovely ensuite, jetted tub, security system, central vacuum, double garage, RV parking, landscaped grounds, and easy access to the neighbouring Galloping Goose Trail system.